I made a little software this week and wish to share it to all of the community. That program allow you to transform you 5 synth monophonic electribe into a 1 synth with 5 poly voices. There's sound and modulator preset system that allow you to load/save easily the sound currently in the electribe. (and in the software of course). 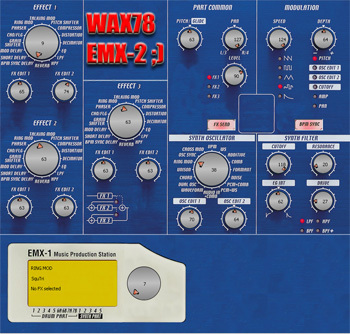 - Enhancer and polyphonisator for electribe EMX-1, 100% written in Java and using the MIDI protocol to achieve it. the 5 channels of electribe. control available (in midi CC or NRPN) on electribe (filter cutoff, level, pan, resonance, ...). - System presets and settings to create in a click, sound of electribe inside a nice interface. - There is no need to touch the electribe and u can now be on your MIDI keyboard and on your PC. - It is also possible to operate the program (preset level and to test the sound in mono) with the wheels and the keyboard electribe. - Ability to save / load the sounds and modulators. - Configure electribe's synth part each on a midi channel (1 to 5). - Put midi cable from PC to Electribe (bidirectionnal or not). - In theory now, u haven't to touch electribe anymore and concentrate on the PC. - You can of course, use the electribe as a remote controle for the software. It ask for MIDI IN (where notes come from, not the electribe). It ask for MIDI OUT (where is electribe). It ask for MINI IN (where electribe note and control will be sent if needed). U can use software or load a general/modulator presets. I'm of course open to all questions, suggestion or bugreports and would be very happy if got feedbacks (positive or not) from users. Nice play with it and good day. Wow, brilliant idea! I will try this s/w! Thanks, and I will let you know if I find any issues. wow, can't wait to try it out, I was beginning to grow tired of the monophone voices, I don't need 5 mono's, but by 1 synth with 5 poly, now that's great. Really pleased to hear that friends. I got some news for you, as i released v 0.0.7 with bugfixes, rewritten VCA and some way to use electribe as keyboard and preset editor. - Fill the 76 PCM list. - Bugfix on slider (when double click to enter the values). - Correction broken download (updater). - React to electribe event (keyboard or controlchange) should be take in account by the program. U can now use electribe as keyboard (but in monophonic) to preset easily on the hardware instead of mouse. - Add a scrollPane to the emxpanel. - Rewrite all the VCA. - More wavetype in VCOs. wow now your talking:)............unfortunately I just upgraded to mac....I know i'm pushing it but is there any perspective of a mac version? it's not how big you grow, it's how far you go! You're not pushing. Of course there's a perspective, a lot of people here and in other forum seems to have a mac. The problem is, i don't have a mac to test my software but i want it to work on windows/linux/mac. The good part is that my software is written in Java so it should work on each system that support java i think. I've recently made changes to make it work with linux (the problem were only the directory separator, != for windows and linux). So i hope (v0.0. will work both on linux and Mac. But if you're able to download v0.0.7 and try to launch it, and be able to tell me if it's work or not. If not cut and paste what's the console tell about error/stacktrace that could help me to find a solution, and in some days or week, the program will be compatible for each system. I hope. Thank for the pm mish mash I don't know how to solve it until i found a mac or experimented mac user playing with java. I juste made 2 videos of the Electribulator, with midi keyboard and Cubase as sequencer. U can see (in 4 seconds) the new VCA system that i've just build. Posted: Sat May 09, 2009 9:19 pm Post subject: ! I tried it but realized that I don't have a second midi input on my pc (for a keyboard). The EMX took up the one and only in and out. So I couldn't play chords or poly, but messed around with the editor while playing some patterns. Got some stuck notes which ended up being like weird droning pads, but I'm not sure if it was me or the s/w. Anyway, it's very cool but I need to get a second midi in for a kbd. Very cool s/w WAX! One question: I noticed the reverb was bypassed as an effect when you look at the effects dials!? It goes from BPM Sync Delay to HPF, jumping over reverb. Is this a kind of message about EMX's poor reverb? lol. or a bug? or just a display bug? Anyway, cool thing you've got going there, and done with Java!! Posted: Sun May 10, 2009 9:24 am Post subject: Re: ! Electribe need one input from PC (to receive notes) and U can use a software sequencer if you don't have other MIDI aivailable. (using midiyoke or stg but i probably misunderstand what u said . I know there's something bug and need to push on 'Resend Preset' button sometimes or play 5 notes to unlock VCAs. And for the FX section, It's just a display bug (i used 360° instead of 330° for the knob). I'm correcting it, adding the name of the effect in the "LCD" and release a 0.0.8 today i hope. I've uploaded v0.0.8 to the server, normally automatic update from 0.0.7 should download automatically the new rar file in 'downloads' directory. - Send Volume 0 on each channel when preset_load. - Add a button to select CC of each modulator inside a human readable list. - Add the BPM Sync that seem to work in fact. - Adding a way to change background while program is running. Adding 2 background from FSK1138(thanks to him). 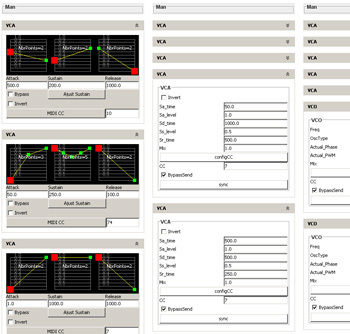 - Creation of a new VCA allowing really complex signal shape. (Delete and insert to remove/add point to the graph). - Yatmandu says : "One question: I noticed the reverb was bypassed as an effect when you look at the effects dials!? It goes from BPM Sync Delay to HPF, jumping over reverb. Is this a kind of message about EMX's poor reverb? lol. or a bug? or just a display bug?" --> identinfy and correct if need. --> Add a system to see wich effect is lastely choosen. (when mouse is on a wheel). I will try the new one later today. Just one question, the EMX has a simple EG control, so how are you getting seperate attack, sustain, release controls with multiple <NbrPoints>? And what about decay? Does the EMX allow midi control of A,S,R but not via the front panel knobs? Just trying to figure out how you did this, thanks.